Long before No Limit Hold’em became all the rage, the Limit tables were where savvy cardsharks plied their trade. Newcomers think that this game is easy because you can’t lose your whole stack in one hand, but those in the know realize that proper LHE strategy is complex and challenging to master. We’ve covered all the basic tips and tricks that you need to know, both preflop and post, like stealing blinds, raising to clean up your outs, the free card play, when to slowplay and when to come out betting, the uses of the check-raise, and more. 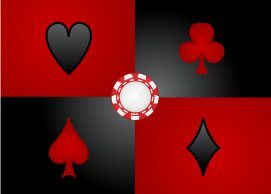 Limit Hold’em is a tough battle because you have to strive and fight for every big bet you win. Don’t handicap yourself through ignorance – read through the articles below to give yourself the best possible chance of prevailing against the other players. It’s common for beginning players to perform poorly at the poker tables. Some of the errors frequently displayed by novice Limit Hold’em players include playing too many hands, cold-calling with inferior holdings, folding good hands to a single bet on the river and more. In Limit Hold’em, you’ll often have a pot equity edge, even with less than 50% equity, if there are many players in the hand. If you can get them to keep putting chips in the pot, you should probably raise with such an edge. If some of them will fold, though, you should probably just call. In Limit Hold’em, you’ll be seeing more showdowns than you would in No Limit poker. This means that you should carefully consider your ranges preflop by judging your hand’s showdown value when deciding whether or not to fold, cold-call, open-raise, or three-bet. In live, low-stakes Limit Hold’em games, you’ll want to pay careful attention to the size of the pot. Postflop, you’ll need to know what pot odds you’re facing whenever you’re considering making a call. Be sure to know how much equity you need to call a given bet size. Big broadway hands are valuable in Limit Hold’em because of the chance of dominating an opponent who is playing worse hands. Suitedness adds to their value. Medium pocket pairs are also usually worth playing despite being often difficult to play properly. When drawing at hands in Limit Hold’em, you need to consider not just your pot odds, but your implied odds as well. This means that you’ll have to estimate how likely it is that your opponents give you action after you make your hand. Don’t use this as an excuse to draw against terrible odds. When playing Limit Hold’em, it’s important not to play too many hands. You’ll want to carefully consider your raising and limping ranges depending on the tendencies of the other players. There’s no use bluffing preflop — you should enter the pot with solid value.